Uh… I’m going to record this and Tommy will edit out all the uhs… All right so, today at lunch I was in the line waiting to get a pizza slice. I saw Harvey standing two spaces in front of me, holding a puppet. It seemed familiar. It was Darth Paper! I asked Lance and Quavondo if I could cut in front of them to ask Harvey something. 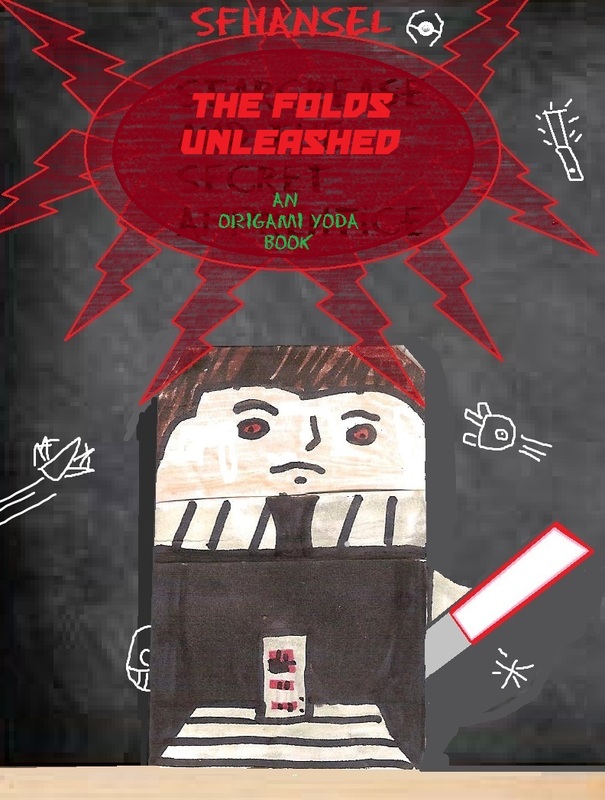 “Uh… Origami Yoda sent me!” I said. “Why didn’t you say so?” said Quavondo. But when I walked up to him, it turns out, it wasn’t even Harvey! It was…Ruth. “Ugh. So you ditched the Drawa, and went straight for Darth Paper?” I said. He ran off, leaving me to grab my lunch. It didn’t look so appetizing. “Nostrul,” muttered Jack as he and I ran through the hallway. I peeked behind me. Nope. Still hadn’t lost him. Zach Martin was still charging. “Split up!” I yelled at Jack. He took a hallway to the right, while I kept going down the middle. Zach, in his anger, fired a spitball at me. I dodged it as it flew like a dart. Why was I here? I hadn’t done anything. Zach just came after me. I sped through the hall, and made my way past the Principal’s Office. I hurriedly backed up, and dodged inside. I heard someone gasp. I turned around, and found someone–not the Principal–sitting in the Principal’s spinny chair. Tony was a kid who once used a Jango Fortune to try and take over McQuarrie, plus he gave us either really good or really bad advice, depending on what he found amusing. He was actually the first enemy student we’d faced since….uhh….I’m drawing a blank. Nevermind. He handed me an Origami Starkiller. Starcreaser. I looked at the finger puppet. Its paper lightsaber glowed red with highlighter. I closed my eyes and took it. The Power of the Dark Side? Tommy ran up to me, grabbed my drafts for my paper, and ripped them. Tommy frowned at me. He looked upset, but he backed away. I ran after him, and bumped into….. I tried to give him a wedgie, but then Tommy stepped in front of me and Ruth, and gave ME a wedgie. It didn’t feel very good. “Go away. NOW.” Tommy said. I don’t like to admit it, but he kinda scared me. I ran from the library, and told the others. It didn’t take long for us to take action and talk to Origami Yoda. The wise paper Jedi was safe and sound with Dwight, and was back to giving us advice. We decided to go to the Principal’s Office, and report this to the Principal, who might just be able to fix the whole mess. When I walked in with Amy (I was feeling pretty confident after my times standing up to FunTime and to Rabbski), I tapped on the Principal’s shoulder. He didn’t speak. Instead, Arnold came up to us. Everybody left. Everybody but me and Amy. We weren’t taking no for an answer. I tapped on the Principal’s shoulder again. No reply. I pressed hard. Nothing. Finally, I spun the chair around, and found a smoldering skeleton sitting in the Principal’s chair. Amy screamed, but I covered her mouth gently. Chippy, our skeleton-model from science class, was dressed in the Principal’s clothes and a wig, and was sitting in the spinny chair. His playful smile was still glued to his face. “Ugh. I never liked that thing anyway,” Amy shuddered. We were about to walk out the door, when Tommy stood in the way and stopped us. Tommy froze. He glanced behind us, and said one word. These past couple days were starting to really tick me off. First, I lose Mace Windu, then Harvey accuses my friend of bullying him, then the Principal doesn’t respond to our problem, and then… I get pants’d. Just a typical day at McQuarrie Middle School. I was with the others, playing Pencil Wars with Arnold, when suddenly all the lights flickered off. For a moment, everything was dark. Then the lights came back on, and my pants were on the floor. Of course, Harvey was doing his big old donkey laugh, and Sara and Remi had to cover their mouths to keep from bursting out laughing. I pulled them up, grimacing. I noticed that Arnold was gone. I ran off to try and find him. I heard Harvey behind me saying something like, “Now he’s running away! Ha!” But I just kept going. I sneaked around the “teachers only” door, which led to the Principal’s Office, and found Arnold snooping around. He was talking to someone. I ran at him, but bumped into Lance, Amy, and Tommy. Tony D. Struction ran over to us. That guy made me a dodgeball once, and I still get angry tears thinking about it. Before I realized what I was doing, I shoved Tony into Arnold and the guy he was talking to. Ruth. All three of them were lying in a big dogpile on the ground. Ruth struggled to get up, and pointed to Tommy. “Get…them….” He croaked. Tommy stood for a moment, holding up his apparently brand-new Starcreaser puppet. (When in doubt, bring up Sara). Tommy’s expression changed. He dropped Starcreaser, and heaved up a big fire extinguisher. He aimed the nozzle at the three enemies. “Run,” Tommy smiled. All three kids scurried and ran. Arnold initially tried to stay, but got a big mouthful of white foamy stuff. They were gone. For now. Tommy called up the Principal, and recounted the days events, including his own treachery. He hung up the phone. “The Principal understands everything that happened,” Tommy said. “And…he’s not mad at me. He understands that kids will be kids.” He smiled. Things were back to normal…sort of. Do you ever have that feeling, after reading a dramatic book or hearing something on the news or watching a movie, where you just feel really weird, and you can’t tell if you love it or hate it? That’s kind of how I felt with Ruth and the gang. They twisted my thoughts and made me think that tricking the teachers would be fun. But that just would have been the whole Papertine mess all over again. And that’s not fun. The Principal came back from his vacation he next day, and allowed every student to have a “FunWeek.” (It’s not as bad as it sounds. It was surprisingly fun!) He allowed all of us to play different games in all the classrooms, plus we got to do all of our fun electives. Arnold even came back to the school, and apologized to the Principal, who even let him join in on the fun. Sometimes, it takes a bit of grace to turn your enemies into friends. Written By SuperFolders Hansel, Camster, and JC. Yay this sounds like an intersting story!!!! But, isn’t Ruth a GIRL name??? Ruth can also be a boy’s name. OMG you used my chapter!!!!! Ten million thank you’d from me! What about my Starkiller story? “The Story of Galen Paperek, Starshredder?” Ring a bell? Who is this guy principal?! Principal Rabbiski is a girl. Please change it. coolest thing ever. I especially love the fire extinguisher part! NIce touch! Also, the beginning of the “The New Apprentice” chapter dosn’t really make sense..
sweet cover. i really liked the idea of an origami starkiller. i will try that. Starcreaser sounds stooky. Has anyone made it? What happens to the origami rebellion puppets!!!!???????????? ?